Lippert Components manufactures and supplies versatile furniture solutions and distributes Furrion brand audiovisual products and galley appliances for boat manufacturers. In addition, we make reliable custom trailers for watercraft. We work with boat manufacturers to develop versatile, compact and comfortable boat furniture to enhance the mobile lifestyle and help the industry attract a broader demographic. We recently won the International Boatbuilders Exhibition & Conference Millennial Award for our sophisticated lounge seat designed for Titan Boats. Fostering a free exchange of knowledge and expertise between our boat furniture team and motorhome furniture team allows us to develop fresh and exciting solutions for both markets. Most televisions are not made to take the beating that 10-foot waves can dish out, but Furrion VibrationSmart™ LED TVs are designed with extra metal plating and heavy-duty metal brackets to withstand extreme travel vibrations. All of Furrion’s audiovisual products, including DC and AC LED TVs, premium speakers, sound bars and multimedia players, are designed to entertain and built to move. Boaters deserve to enjoy the comforts of home onboard, including freshly cooked meals. That’s why Furrion offers a premium line of galley appliances specifically designed and tested to withstand the rigors of the marine environment. The new Chef Collection includes sleek, high-performance induction cooktops, microwaves and low-water usage dishwashers. For more than 50 years we have manufactured quality watercraft, motorcycle and equipment trailers with all sorts of excellent optional features including storage boxes, spare tire carriers and bike carriers. Every one of our boat trailers features a heavy-duty safety chain, steel fenders and steel-reinforced carpeted bunks for reliable stability and safety while towing. We also build custom heavy-duty trailers including Fifth-wheel goose neck trailers and forklift trailers with a range of durable materials including, steel, iron and wood. We offer a range of Furrion connected power solutions including cordsets, inlets, adapters, connectors, plugs and accessories engineered and tested to meet global marine industry standards, and constructed for longevity in harsh environments. The Platinum Series offers modern stitch lines, color choices, accents and pockets to store your valuables. Designed for comfort with multiple density foam packs, suspension e-coated steel frames, reclining backrests, self-leveling arms, and flip-up bolster options. Constructed to stand the test of time, with vinyl, thread and foam treated to resist mold, mildew and UV rays, e-coated steel frames or polyethylene, roto-cast cores, corrosion-resistant fasteners and a universal bolt patterns for easy attachment to marine hardware. The unique flip flop seat features recessed arms and a split lid for easy access to the base, which can be used for storing goods, as a cooler or a livewell. The Platinum Series assortment includes high back, low back bucket and flip flop seats available in white, grey and beige. 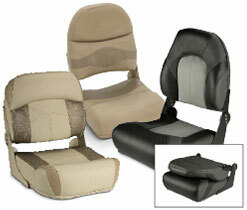 In addition, for optimal Ultraleather® luxury, view our Black Label seating collection, and for OEM builders. Lippert Components offers a wide range of high-quality, custom seating solutions. Whether you're fishing on an inland lake or the ocean, on your pontoon boat or your bass boat, LCI's Fold Down Seats offer fishermen the comfort and durability they desire. The Platinum Series high-back, fold down seats match LCI's Platinum Series replacement pontoon furniture and are available in beige, grey or white. The Fishing Fold Down Seats offer two-tone grey or tan, racing styling, multiple density foam packs, heavy-duty hinges, mold and UV resistant, soft touch vinyl, and corrosion-resistant fasteners. 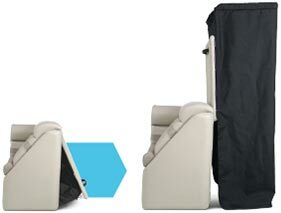 High back and low back with built-in cup holder models available. LCI invites you to enjoy fishing in comfort and style. Black Ice is an innovative new vinyl treatment for dark vinyls that is up to 24 degrees cooler than traditional dark vinyl. It maintains the same temperatures in direct sunlight as earthtone vinyl colors onboard the boat. Black Ice can be used on a wide variety of furniture, which we refer to as Blackout Furniture. Whether you are in a warm region of the country, are looking for seating for the bridge of a houseboat or simply want durable outdoor white furniture on your boat, the Lippert Components Platinum Series furniture offers clean lines, durable construction, functionality, storage and more. The assortment includes 23 items: benches, corners, arms, chaises, helm stands, accessories and seats available in three monochromatic colors: grey, beige and new for 2018, white. The Platinum Series Configurator App is a web-based tool, easily accessible on your laptop, tablet or cell phone. Enter the size of your boat, then drag, drop and rotate furniture to create a custom pontoon floorplan. Choose from more than 20 unique pontoon items from our Platinum Series line. The app creates a PDF of the floorplan and parts needed to achieve the configuration. Ultimately, the Platinum Series Configurator App eliminates the guesswork of sizing furniture, developing floorplans, and streamlines the process of ordering replacement pontoon furniture. Ideal for full days on the water. The privacy station easily expands from a hatch at the back of the chaise and is made with outdoor, marine grade fabric with a zipper for easy entry and exit. Use this space to change clothing, for a portable toilet, or simply for added shade and privacy. Its durable construction withstands the marine environment. 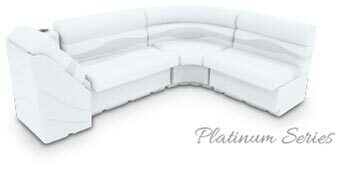 The design matches the LCI Platinum Series pontoon furniture collection and is available in grey, beige or white. Furrion Bluetooth stereo systems are designed to create a seamless, personalized experience whether keeping the kids entertained or equipping your boat with the latest technology for some high-quality down time. 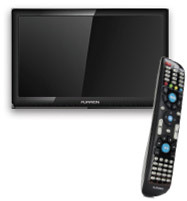 Furrion's assortment includes single, dual and triple independent zone entertainment systems, some with Smartlink™ connection to Furrion's televisions and DVD systems. Feature rich with advanced connectivity and technology. Furrion's range of stereos provide quality entertainment, constructed for life in motion. Sound quality is Furrion's focus. Whether battling ambient noise on the water or finding the perfect balance of base and treble for your favorite music. Furrion offers high-quality 12V passive sound bars, subwoofers, indoor, outdoor and portable speakers that surround you with rich, bold sound from the latest audio system technology. Take onboard entertainment to the next level. No shore or generator power available? You can still watch your favorite films and videos with Furrion's 12 Volt DC powered televisions. The built-in surge suppressor eliminates picture distortion from voltage fluctuations, and the static isolator eliminates sound interference. Combining the vivid A+, name brand panel and enhanced sound with advanced Climatesmart™ and Vibrationsmart™ technology, durable construction, connectivity and style, the LED HD TVs from Furrion offer state-of-the-art entertainment onboard. 19" and 22" 12V DC. TV-DVD Combos and 19"-50" 120V AC models available all with universal remotes. View our 2018 Marine Catalog here. *Furrion & Lippert products are also sold through local marine dealers.